On Wednesday 7 March at 7.30pm, a panel discusssion will take place at the West Lane Baptist Centre in Haworth which will include Stevie Davies, Patricia Duncker and Michele Roberts. In the chair will be Patsy Stoneman. All of these authors will acknowledge a debt to the Brontës. Tickets are £6.50. They are available from andrew.mccarthy@bronte.org.uk, phone 01535 640194. 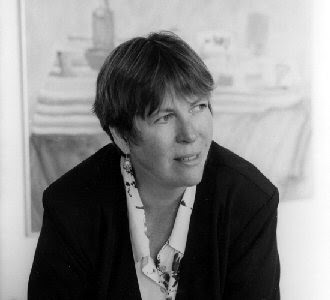 Below - Patricia Duncker, Professor of Creative Writing at the University of East Anglia in Norwich. 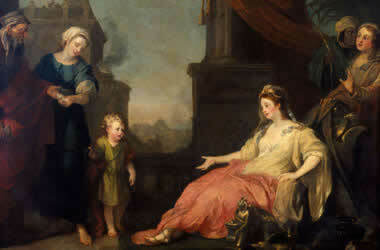 The painting is Moses Brought Before Pharaoh’s Daughter by William Hogarth, which is in the care of the Foundling Museum in Brunswick Square, London. This will be visited by Brontë Society members (and non-members, so consider yourself invited) on Sunday 4 February. Meet at 12 noon outside Russell Square Tube Station - which is on the Piccadilly Line. Admission to the Museum is £5. James Grenwood employed sixty hands at Bridgehouse in 1833, half of them under sixteen and some as young as ten. This was an advance on conditions thirty years earlier, when james Greenwood's cousin John at Vale Mill, half a mile downstream from Bridgehouse, was employing orphaned girls from as young as five, assigned to him from the Foundling Hospital in London. Another London event for Society members and anyone else who wants to join in - Tea and Chat at the Barbican on Sunday 11 March. Meet at 12 noon at the Waterside Café for tea and Brontë chat about Jane Eyre. The Parsonage is closed to the public at the moment, as usual at this time of year, but there is plenty going on. In the picture, Librarian Ann Dinsdale and Curator Polly Salter are seen dealing with one of many seasonal tasks. On Thursday 1 February, a new, special exhibition will open to commemorate the 150th anniversary of the publication of Mrs Gaskell's The Life of Charlotte Brontë. The exhibition, which is free on admission to the museum, has the same title. The Brontë Society has sent its condolences to the family of Charles Lemon MBE, who died on the morning of 4 January. His funeral is at St Anne’s Catholic church in Keighley at 12pm on Friday 12 January. 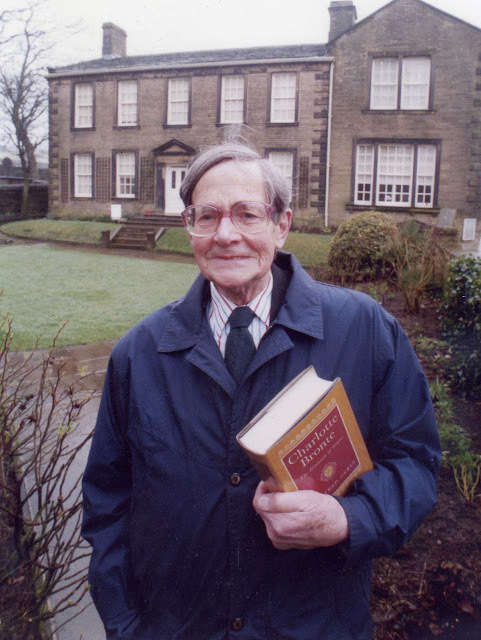 Charles Lemon joined the Brontë Society in 1936 after having cycled to Haworth (from London) the previous year. He was a very active member, elected to the Society’s council several times and serving as chairman. He was the editor of Transactions (the Society’s academic journal) from 1964 – 1983 and served on the editorial board of Brontë Studies, the journal which replaced it, until the day he died. As Bibliographical Secretary (a post which no longer exists) he frequently attended auctions on behalf of the Parsonage, helping in the purchasing of letters and other Brontë memorabilia. Current Chairman of the Brontë Society Richard Wilcocks commented, “ With the death of Charles Lemon we have lost an extraordinary member. Previous Chairman Bob Barnard said, “He was a gentle, scholarly man, enormously well-read, who came over the years to represent all that is best in the Society”. When he spoke to younger members of his family he remembered that as a young child in London he was held by his mother during bombing raids - by Zeppelins. He also recalled the return of his father from the Great War: he had been fighting in France and in Italy. He attended Davidson Road Junior School, which a few years earlier (1908 - 1911) had boasted D H Lawrence on its staff. Later, at Selhurst Grammar, where he first discovered Jane Eyre, he particulary loved History, Latin and English, and would undoubtedly have had a distinguished university career had his parents' finances permitted - but he left to take a job at the age of sixteen. A full obituary will appear in the next issue of Brontë Society Gazette.